With 739 sets of steps, Pittsburgh has more municipal stairways than any city in the U.S.. That’s according to Bob Regan, author of his updated “Pittsburgh Steps” (2015), which is part historical record and part guidebook for active step trekkers. Of these stairways, 344 are legal streets — composed just of steps. Built primarily in the late 19th and 20th centuries, the city’s steps connect families and neighborhoods and often are the main transportation arteries through our topsy-turvy topography. Tall buildings as well as a popular North Side water feature also sport some impressive steps. With 68, the South Side Slopes’ stairways comprise more than 10 percent of the city’s 45,454 total steps. 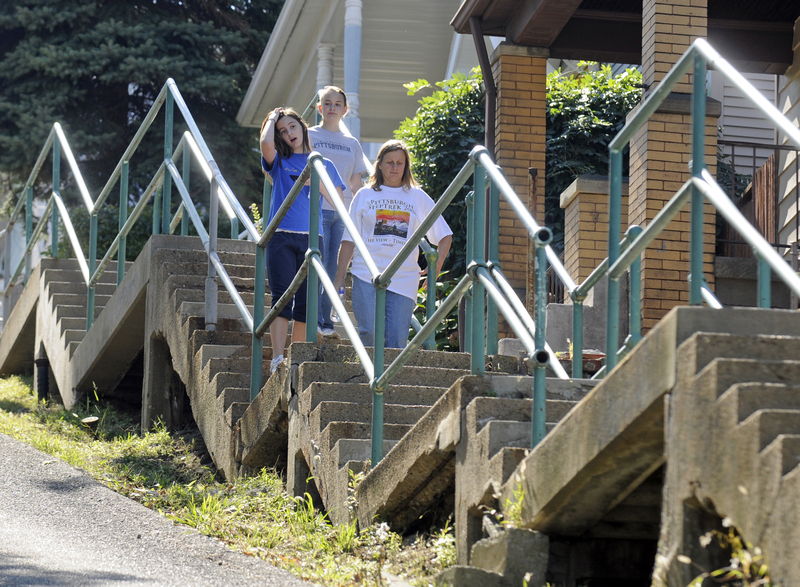 Each October, the South Side Slopes Neighborhood Association sponsors the StepTrek, which offers two courses covering 2,500 of roughly 5,500 steps on the hillside. The patchwork of ascending trails meander by churches, small homes and mansions, through fields and along narrow alleyways, all providing breathtaking views of the Monongahela River and Downtown Pittsburgh. If you added up all of the elevation covered, according to the StepTrek website, you’d reach 1,460 feet — higher than the Empire State Building at 1,454 feet and the Eiffel Tower at 984 feet. At all hours on any given day you’ll find an assortment of people walking up Staircase A in University of Pittsburgh’s Cathedral of Learning in Oakland, the tallest educational building in the Western hemisphere. From the ground floor to the 36th floor, there are 764 steps to one of the best panoramic views of the city. But the attraction is the workout. The steps draw bike clubs, running groups, crew teams and more. From the ground floor they ascend three floors, then cross the hall, go up a few steps and through a set of doors and move to a wider staircase that will take them up to the 17th floor. From there they switch to a narrower staircase and climb to floor 31, switch again and then up to 34. Take a short hallway to the right (there’s a water fountain) and then open a door to the left. Then it’s just two more floors up to the highest point the public is generally allowed to go. Few run the steps; most just walk up. Those who are fit can make the climb in 10 minutes or less. Most people take the elevators to the bottom and then march right back up. Overlooking the Monongahela River is a tall staircase that can make even the bravest adventurer a little light-headed. It rises 170 steps from Second Avenue at the south entrance of the Armstrong Tunnels up to the top of the Bluff, connecting to Duquesne University’s campus pedestrian walkway that crosses the busy Boulevard of the Allies. You feel like you’re just clinging to the hillside. But you can’t beat the view. These steps were added in 1919, replacing what Mr. Regan says was then another incline — the Fort Pitt Incline. Another October step challenge is offered in Fineview, the neighborhood that lives up to its name by rising above the Central North Side with a splendid view over the Allegheny River, Downtown and Point State Park. You can access the steps that take you straight up from behind Allegheny General Hospital. The 5K race/hike stepathon route covers 12 public staircases for a total of 1,600 steps — the equivalent of a 17-story building. You’ll encounter Rising Main Way, which at 331 steps, is the fourth-longest staircase in the city, according to “Pittsburgh Steps” (the longest is on Raye Avenue in Brookline at 378 steps). A great time to visit Fineview is when fireworks are launched off the Point. Dedicated in 2001, the 8,000-square-foot water feature of 500 sandstone blocks and shallow pools facing the Allegheny River on a North Shore hillside is a popular (and free!) warm-weather oasis for children and adults, as well as walkers, runners and cyclists. The fountain, just west of PNC Park, is designed for water play, a cool soak or just a restful respite for those who perch themselves atop the sandstone blocks that are cut from a Butler County quarry. The water spills over a 4-foot waterfall before cascading down the stones and recycling back to the back of the top of the waterfall. It’s part of the park designed by landscape architect Dennis Carmichael of EDAW.